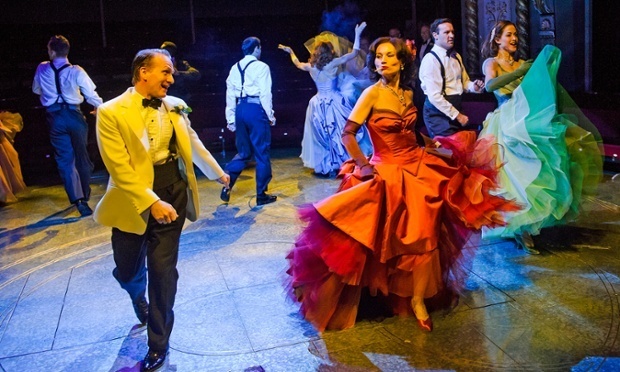 Ladies and gentleman, that is precisely the sort of fancy-dan stagecraft you expect to see in Cole Porter musical about snobbish American socialites, and sadly is something we don’t see enough of through the rather interminable fast half. 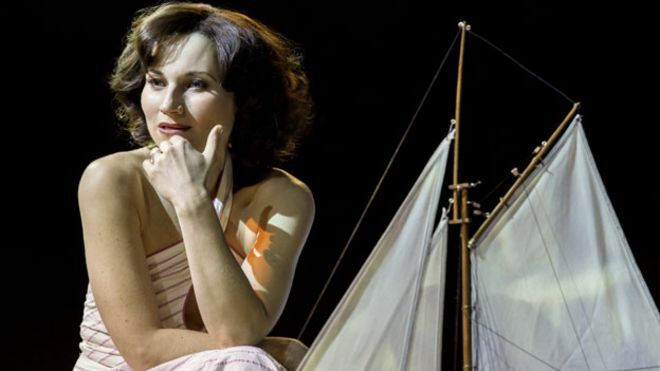 It then proceeds to race along to the finale as the plot unspools in exactly the sort of way you would imagine a Cole Porter musical inspired by a 1930’s comedy to do. The famous numbers roll out think and fast, with Just One of Those Things, Well, Did You Evah! and You’re Sensational tumbling one after another – and all handled with confidence and competence by the cast. The real high point of the show is Kate Fleetwood. Perhaps most well known as a dramatic actor, she proves –following her stint in London Road – to be a musical performer of the first rank. Watching Fleetwood, you realise how rare it is to see genuine acting in a musical. In most shows you have excellent singers and dancers performing rather than acting. As Tracy Lord, Fleetwood inhabits the character with the same rigour that I would expect to find if she was approaching Ibsen. A moment in the middle of Lets Misbehave exemplifies what she does so well. Despite matching the professional dancers step-for-step, twirling and spinning through the whirlwhind choreography of a party in full swing, the moment that Tracy realises Dexter is leaving Fleetwood turns from performer to actor. The party appears to recede into a blurry background, as she manages to hold the audience with the sight of cracks in the granite exterior Tracy has built around herself. Fleetwood perfectly captures the underlying fragility behind her brittle nature. The unarticulated emotional pain runs through her, captured in her expression, the smallest set of the mouth and a slight slump of the shoulders. Then stiffening, a firming of the resolve, a spin and Fleetwood’s Tracy is back facing the rest of the party-goers, the music fades up and Lets Misbehave crashes through to its conclusion. Small moments of great acting happen so rarely in major musicals that they are worth savouring when they appear. High Society didn’t need that miniature moment of magic but it is all the better for it, and demonstrates that where possible it is always better to have an actor who knows how to sing than a singer who is doing their best to act. This is reinforced by Jamie Parker – fresh from the excellent Assassins at the Menier Chocolate Factory – who almost matches Fleetwood step for step, and brings a much needed high-energy, comic touch to the role of Mike, the hapless reporter. Another actor branching into musicals, Parker has shown himself to be as comfortable with Porter and Sondheim as he has been with Shakespeare and Bennett. Now into his mid-30s, Parker is looking every inch a major theatrical talent and is building a stellar portfolio whilst avoiding the media glare that some of his contemporaries enjoy. Ultimately this production of High Society is hamstrung by the book. The first half is fatally slow, and when something clocks in at just over 2hr45min you would have appreciated some judicious cutting along the way. The second half is fantastic but it must be acknowledged that the way that the play treats the boring but rather blameless George Kitteridge leaves a very sour taste in the mouth. It may be light fluffy fun, and a certain amount of elitist snobbery is only to be expected, but the socialites of Oyster Bay really are just awful people. For all the jokes, drinking and rather libertine lifestyles, Tracy and her whole family have no time for those not of their ilk. Whilst we all know that she is going to reject dullard George for fun-loving Dexter, the way she does it is callously off-hand and played without a hint of irony. It does make you rather long for the expose that the newspaper reporters initially turned up to write. And so we draw to a close with a final nod to Kevin Spacey. The show runs until the end of August (and I do wonder if he will resist the temptation to appear in a cameo role on the last night) and then we being the hotly anticipated tenure of Matthew Warchus. As the sun sets on Oyster Bay, a new dawn beckons for the Old Vic.